Everyone in my immediate family has had colon related issues. Everyone. The colon is so important to health and hence maintaining healthy hair because it allows us to use all the good things we put into our body, but also to eliminate the waste products. If it is clogged, or coated with a layer of slime and mucus, neither of these processes can take place very well, and toxemia results. Toxemia is the accumulation of toxins in the blood and tissues in the body. The same toxins that attract flies to filth and kill fish in rivers are the same bacteria that pollute the body. Many of today’s most common and deadly diseases, such as Cancer, Diabetes and Cirrhosis of the liver, are caused not by viruses or other germs, but rather by long term accumulation of toxins and acid wastes in the body, which create the conditions of tissue toxicity that germs require to infect the body. 1. Massive toxic overload. Our body has a natural waste elimination process, but it gets overwhelmed beyond it's capacity from all the unnatural environmental toxins in food, air and water. 2. Foods not digesting properly and fermenting and putrefying in the body. They then form a wall around your intestines that prevents nutrients from being able to be absorbed by the blood. This is the reason that many obese people are chronically malnourished. 3. Impairment of the body's natural cleansing mechanism. This is caused by lack of adequate rest. Our stressful lifestyles constantly keep us in "Fight or flight" mode and we do not go into "rest and recovery". 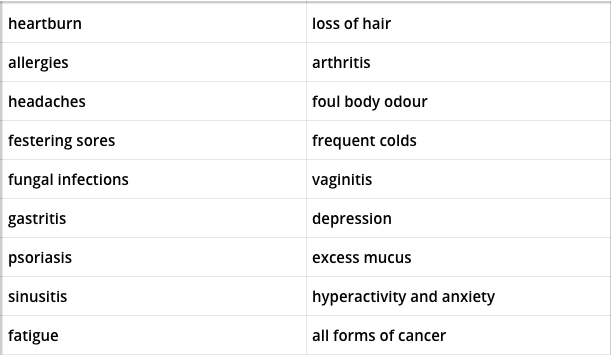 From the Tao of Detox by Daniel Reid, here are some of the most common symptoms associated with Toxemia. In 1931, Dr. Otto Warburg won nobel peace prize when he discovered that all cancer, without exception, derives from an acidic environments that lack oxygen. Clearly the best way to prevent cancer and many other degenerative diseases is to alkalize and oxygenate the body and eliminate the conditions for cancer cells to thrive. Modern medicine has not only ignored his findings but they refuse to admit they've gone down the wrong route because cancer therapy is their most profitable branch. Imagine there was a pile of garbage on a table and flies and maggots were surrounding it. Would you try and get rid of it by killing the flies? NO! You'd clean up the mess. Modern medicine essentially tries to kill the flies and maggots with chemo and drugs, which are the symptoms of toxicity, without addressing the root cause, the mess itself. Detox stands for detoxification, and is a period of time over which the body activates its natural healing mechanisms by pouring toxins stored in the cells and tissues back into the bloodstream for elimination through the kidneys and other organs. When digestion is ceased for 24-48 hours the body flicks a switch to "rest and recovery" and begins to purge to toxins into the bloodstream for elimination. Bentonite clay contains positive ions that draw out dirt and impurities from the crevices of your colon when taken internally. It has a chalky taste that I wasn't necessarily mad at, but not something I look forward to. Psyllium Husk is a bulking fiber that acts like a broom to sweep out all the mucus and junk from your colon. It tastes how it sounds, like a very earthy grainy taste that was not pleasant at all. I've used this SuperFood powder on many occasions because I love that it contains all the micro nutrients that our body needs, but is often lacking in our food supply. When taken during the detox, it provides your body with nutrients while allowing your body to stay in detox mode. Colon irrigations literally flush out the system and release an astounding amount of waste from the walls of the colon. Remember the putrified river of waste that lines your colon and prevents proper absorption? Well one of the most effective ways to clear that out is through a colon irrigation, not to be confused with an enema. This is really important during a detox since your body is rapidly pumping out toxins into your blood stream there needs to be a process in place of eliminating them. While Colon Hydrotherapy sessions at a clinic can be expensive, there are some at home options that provide the same benefit. I went into the cleanse feeling very excited because when I'm passionate about something I tend to go balls to the wall. At first I tried mixing the ingredients separately, but then ended up combining them into one big murky mixture. It didn't taste great but it was doable. I got through 2 of them on the first day. I did end up doing an enema because I did not have the resources available to invest in an at home colonic. My energy the first day was pretty high so I still found myself working on proposals and videos even though I was supposed to be in "rest mode". That night when I went to sleep my dreams were extremely vivid and I was sweating a lot. Probably my body's way of trying to rid itself of all the toxins. I woke up in the morning with worst headache ever. It felt similar to how you'd feel after a night of heavy drinking with no food to soak up the alcohol. The more water I drank the worse it got because I was just flushing more toxins into my system. In a desperate attempt at relief, I did another enema. This made me feel well enough to be able to go to my audition. Then afterwards I had the bright idea of going to the sauna at the gym. My logic was "I need to sweat more so that I can speed up the detox process". Huge mistake. I overtaxed my body and almost passed out on the way home. I literally collapsed into my bed and when I woke up I couldn't bring myself to drink another one of those drinks. I decided to end my detox and make myself some steel cut oats. I definitely am doing the detox again when I have enough discipline to completely disconnect myself from everyday life and focus solely on my health. Ideally I would check into a clinic that can help facilitate the process. In the mean time, I am shifting my focus to learning more about Trophology, or the art of proper food combining, so that my meals are properly digested. I am hoping that my journey will inspire you and those I care about to consider how they can rid themselves of toxins and become less reliant on a medical system that operates on flawed methodology. What are your thoughts? Does this detox seem too extreme?